Rheumatoid arthritis (RA) is a chronic, systemic, polyarticular, inflammatory, autoimmune disorder resulting in degeneration of the synovial lining in joints, making them swollen, stiff, and less functional. It affects women three times more than men. There have been many previous studies reported about Naturopathy and Yoga therapies in RA, diabetes and hypertension separately. Lack of evidence in using integrative Naturopathy and Yoga Therapies (INYT) especially in patient with RA associated with type-2 diabetes and hypertension made us conduct the present case study. A 54-year married woman diagnosed with RA in 2002 and underwent conventional management in a private hospital. Her symptoms, as described by her, began with moderate to severe pain associated with swelling, stiffness (more in morning) in multiple joints especially over bilateral small joints, elbow, shoulder, knee and hip joints. Physician advised her to take Methotraxate and Hydrochloroguine. In 2008, 2011, and January-2014 she was diagnosed as having hypertension, type-2 diabetes and gangrene in the second toe of the right foot. Following this, she underwent conventional management. In July-2014 she visited our college hospital and was on Methotraxate, Hydrochloroguine, Prednisolone, Diclofenac sodium, Folic acid, Rabeprazole sodium, Amlodipine, Glimepiride, Telmisartan, combination of Calcium corbonate; Vitamin D-3; and Elemental Zinc (CaltenD), Clopidogel, Vitamin B complex and multi-minerals (Cobadex CZS), Rosuvastatin. Written informed consent was obtained from subject. The treatments such as Naturopathy (60 – 90 min. ), Yoga (60 min. ), and acupuncture (30 min. ), were given daily for 10-days along with the patient's prescription medicines (except Diclofenac sodium). A detail of intervention is given in [Table 1]. Data assessments were done before and after intervention [Table 2]. It was used to evaluate subject's pain intensity on a scale of 0-10, where 0 indicates no pain and 10 indicates highest pain. Subject was suggested to mark on the scale to indicate her pain intensity. It is a 42-item questionnaire which includes threeself-report scales designed to measure state of depression, anxiety and stress. Each scale contains 14 items where subject was asked to use four point severity/frequency scales to rate the extent to which she had experienced each state over the past week. It consists of a 36 item questionnaire which measures the health in 8-dimensions. For each dimension item scores were noted, averaged and transformed into a scale of 0-100 where 0 indicate worst possible health and 100 indicate best possible health. Blood and bio-chemical analyses were done to assess hemoglobin, erythrocyte sedimentation rate (ESR), white blood cell (WBC) (total and differential counts); and to assess fasting blood sugar (FBS) and postprandial blood sugar (PPBS) levelsrespectively. Bio-chemical analysis was done by using CKK-24 Versatile Bio-chemistry Analyser, Bangalore, India. Systolic blood pressure (SBP) and diastolic blood pressure (DBP) was assessed before and after the treatment period in sitting position using a standard mercury sphygmomanometer. 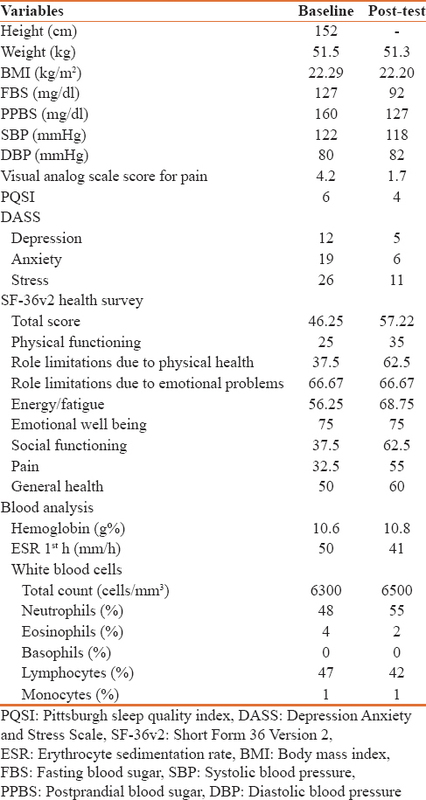 Result of this study showed improvements in VAS pain score, FBS, PPBS, hemoglobin, ESR and WBC counts; PSQI, DASS, SF-36v2 health survey scores with maintenance of SBP and DBP compared to baseline [Table 2]. These results may be attributable to the INYT intervention along with conventional medicine. Acupuncture,, massage, mud, hydrotherapy, and yoga  were shown to have positive role in reducing pain even after stopping the medication for pain (i.e., Diclofenac sodium). Hence, this result suggests that the INYT was not only useful to reduce pain but also useful in reducing the medication for pain and its adverse effects. Possible mechanisms of pain reduction in acupuncture might bethrough modulation of nor-adrenaline and serotonin signalling system; production of endogenous opioids, somatostatin and other neurotrophins that together enhance descending inhibition of nociception on spinal afferents. Massage might reduces pain by promoting muscle relaxation. Temperature and pressure of water in hydrotherapy can block nociceptors by acting on thermal receptors and mechanoreceptors and exert positive effect on spinal segmental mechanisms, which is useful for painful condition. Mud might reduce inflammation and sulfur minerals absorbed by skin might cause an analgesic effect. RA patient may have excessive tumor necrosis factor-alpha (TNF-α) which causes destruction of articular cartilage, bone resorption, and inhibition of bone formation. Our study showed reduction in ESR and previous studies on acupuncture  and mud therapy  reported its anti-inflammatory effects. This might be attributed to reduced inflammatory reactionand cartilage damage; and improvement in cartilaginous hemostasis by reducing inflammatory cytokines such as TNF-α,, interleukin-1b  and by increasing chondroprotective insulin-like growth factor-1. Anti-TNF therapy is shown to restore patient's immune cells and hemoglobin, and reducing rheumatoid factor levels, cytokine production etc. Similarly, our study shows improvement in immune cells and hemoglobin. Previous studies on yoga,, hydrotherapy, acupuncture  and mud therapies  reported to reduce rheumatoid factor in RA , and rejuvenate immune organs; improve immunity; and reduce cytokine productions such as interleukin-1b  and TNF-α, respectively. Stress is associated with triggering autoimmune disease and worsening of RA symptoms but yoga was reported to reduce stress and have effect on musculoskeletal system. This suggests that yoga should be considered as an add-on therapy for RA. This is also supported by the results of our study. Yoga is effective in hypertension, diabetes, stress, and RA., Yoga was reported to improve pancreatic beta-cells; insulin sensitivity; glucose uptake by muscles  and reduce blood glucose. Massage was reported to promote parasympathetic activation  which reduces heart rate, BP, stress; decrease cortisol and increase serotonin, dopamine and endorphins which are useful for pain reduction and for improving QOS. Acupuncture can increase the content of γ-amino butyric acid and may enhance QOS. Mud-pack therapy enhances skin blood circulation, and sauna therapy improves endothelial function. It also increases endothelial nitric-oxide synthase activity; and improves peripheral blood flow in ischemic limbs  which might have proven useful for our subject since she was diagnosed with gangrene in the second toe of her right foot. Improvement in pain, blood sugar, blood analysis, depression, anxiety, stress and maintenance of normal BP might alsohave contributed to improvement in QOS and QOL in our subject. Limitations of our study include lack of assessment of major inflammatory bio-markers. The validity and reliability of the results of this case study may vary because it is a single case. The subject was not followed-up to see whether or not these effects were sustained. Hence, further studies are required with larger sample size and more advanced techniques to validate our results. Result of our study suggests, INYT may be considered as an adjuvant to conventional medicine in patient with RA associated with type-2 diabetes and essential hypertension. Cubick EE, Quezada VY, Schumer AD, Davis CM. 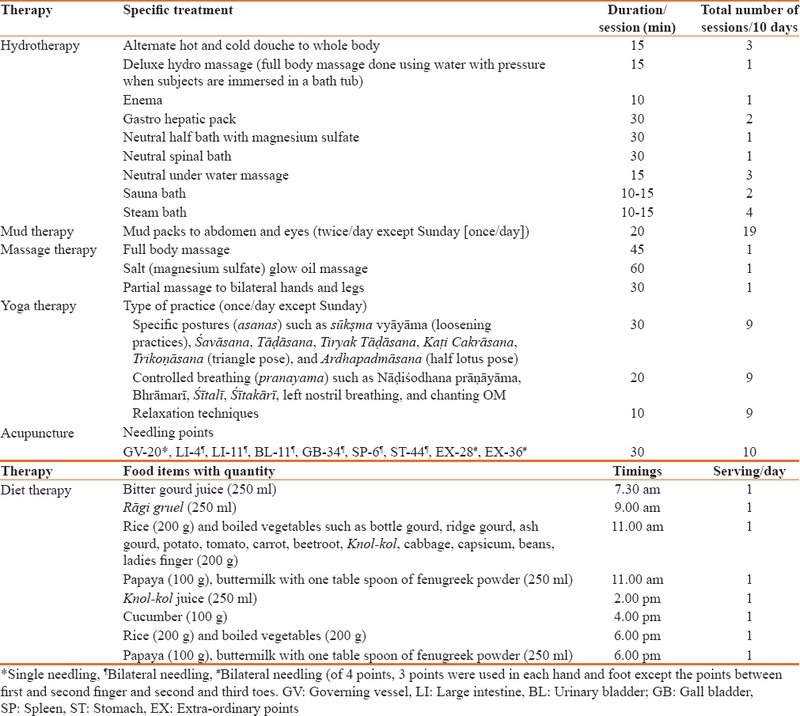 Sustained release myofascial release as treatment for a patient with complications of rheumatoid arthritis and collagenous colitis: A case report. Int J Ther Massage Bodywork 2011;4:1-9. Telles S, Singh N. Is yoga a suitable treatment for rheumatoid arthritis: Current opinion. Open Access J Sports Med 2012;3:81-7. Mooventhan A, Nivethitha L. Effects of acupuncture and massage on pain, quality of sleep and health related quality of life in patient with systemic lupus erythematosus. J Ayurveda Integr Med 2014;5:186-9. Jayasuriya A. Clinical Acupuncture. Revised Edition. New Delhi: B Jain Publishers Pvt. Ltd.; 2013. p. 135-295. Lovibond SH, Lovibond, PF. Manual for the Depression Anxiety Stress Scales. 2nd ed. Sydney: Psychology Foundation; 1995. Jenkinson C, Stewart-Brown S, Petersen S, Paice C. Assessment of the SF-36 version 2 in the United Kingdom. J Epidemiol Community Health 1999;53:46-50. Leung L. Neurophysiological basis of acupuncture-induced analgesia – An updated review. J Acupunct Meridian Stud 2012;5:261-70. Bostan B, Sen U, Günes T, Sahin SA, Sen C, Erdem M, et al. Comparison of intra-articular hyaluronic acid injections and mud-pack therapy in the treatment of knee osteoarthritis. Acta Orthop Traumatol Turc 2010;44:42-7. Telles S, Naveen KV, Gaur V, Balkrishna A. Effect of one week of yoga on function and severity in rheumatoid arthritis. BMC Res Notes 2011;4:118.